Find here all the information prior to your visit at the Park. Do not hesitate to contact us at the 03 85 55 26 23 If you would like more information. 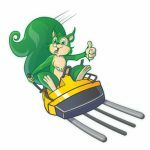 Before scheduling your visit make sure that the Park is open. To save time and access within the Park you can buy your tickets online. With your smartphone directly present your ticket without printing them. Payment by credit card only. You can use these tickets on the current year. - Bank cards without amount minimum, including points of sale of drinks, ice and restore. - Holiday vouchers. Holiday vouchers are accepted in all the restore points. Parking cars and buses are free. For motorhomes, area drain all water and free food and free parking. Access, entry as output of the Park is free. Picnics are allowed outside and inside the Park (except terrace of the snack of Combes). Wilderness areas are set up. For reasons of safety (builders standards), access to certain attractions is regulated in terms of size. Compliance with these rules is imperative. Younger children can be measured prior to accessing these attractions. Dogs are allowed on a leash in the Park. 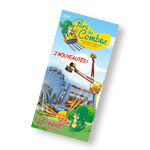 Download here the combes Park brochures. You want to receive our brochures by mail? Make your request in clicking here. Download public Combes Park brochure and discover our attractions, the rates and practical information.